Most search marketers would agree that content marketing is an essential cog in the wheel of SEO. Exceptional content that delivers value and purpose can earn links naturally, fueling a website’s authority and overall ranking potential. When content marketing strategies are infused with subtle layers of SEO and keyword targeting, the potential to realize greater search engine visibility is dramatically increased. This can compound the efficacy of content marketing, helping to generate more quality traffic to a site. Having researched, developed, and executed a number of SEO-infused content marketing strategies, here I share a few tips that I employ to craft meaningful content that contributes to higher search visibility. 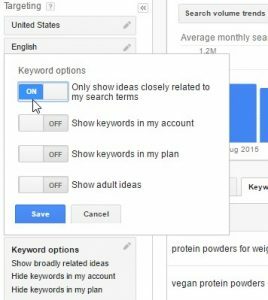 There are a number of keyword research tools that you can use, but here we’re going focus on the Google Keyword Planner. 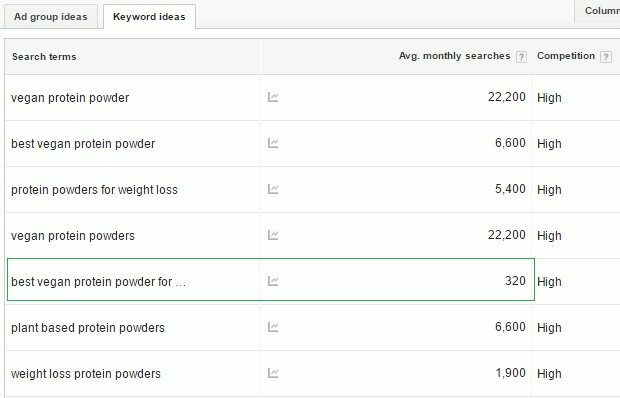 What’s nice about the Keyword Planner is that you can see search volume data (how many searches a given keyword phrase gets in a month) as well as other insights based on competition and how popular keywords are searched throughout the year. 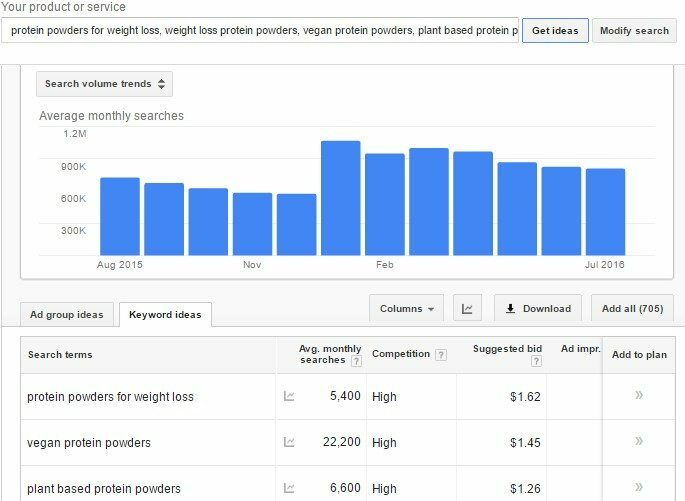 Based on the example screenshots, protein powders for weight loss are a bit more popular in January as individuals start their new year’s resolutions. For this reason, we may want to publish this article in October or November, as high rankings can take time to actualize. Using the Keyword Planner is pretty straightforward, however there are a number of different parameters that you can set to for more relevant data (i.e. location targeting, language targeting, “Keywords to include,” etc.) I suggest using the settings under Keyword options (found under Customize your search.) Among the most handy is the option to Only show ideas closely related to my search terms. 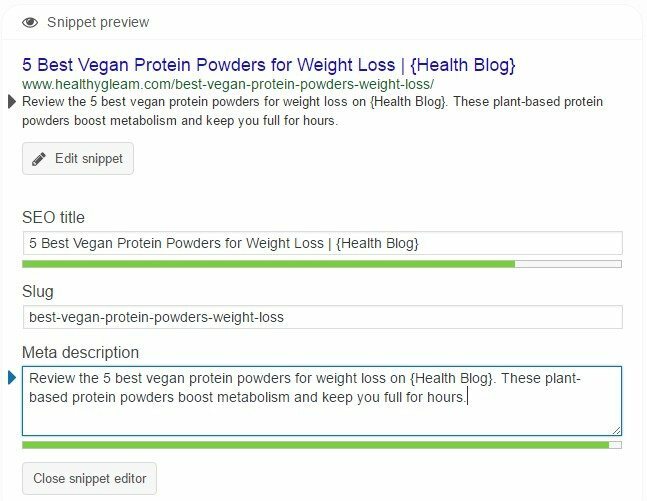 Unless you’re submitting very precise long-tail keywords (4+ word phrases,) this option will enable you to refine your results to display data that’s more precise. Otherwise, the keyword data is often very broad with many search terms that may be unrelated to the focus of your research. In the context of SEO-infused content marketing, we’re not looking for the most popular keyword phrases with the highest search volume. Instead, we’re seeking long-tail phrases that inspire ideas for content creation. 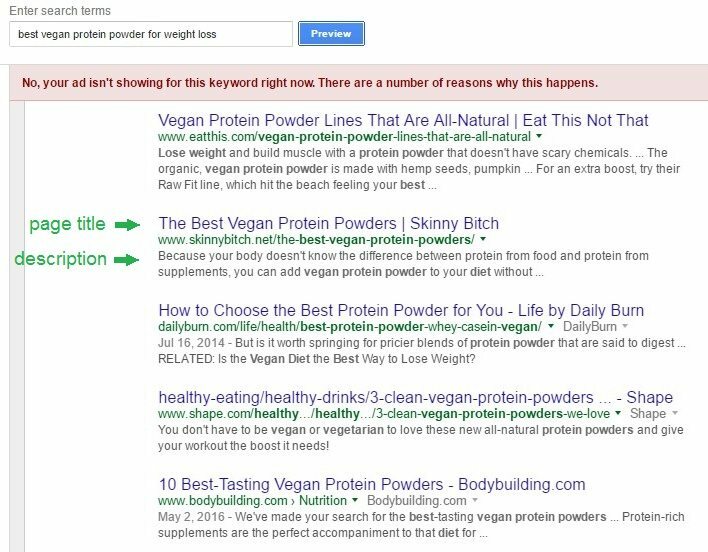 In our example, the phrase “best vegan protein powders for weight loss” is a perfect long-tail that gets 320 searches per month. While in the Google Keyword Planner, you can click the small drop-down arrow next keywords and select the option to Open in Ad Preview and Diagnosis. Not limited to advertisers, this hand tool enables you to view the organic search results for keywords you’re researching. Using this tool allows you anonymously preview SERPs based on certain locations and different devices. Experienced SEO’s may find this to be a nice alternative to using Google Incognito or a private browser. In previewing the Google SERPs for desired keywords, the objective is to get a lay of search landscape and see how the top ranking content is positioned. Take a look at how each listing is using keywords in the page title and meta description. How creative and compelling are they? Are they using the keyword in verbatim or exact match form? 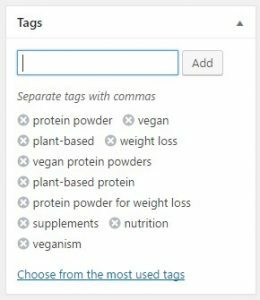 In the case of our example, none of these listings are using “best vegan protein powders for weight loss” in exact match form. Based on this assessment, we could choose to optimize our article to be very aligned with this specific keyword phrase. In doing so, and depending on our site’s domain authority, we could see decent rankings with little to no links or use of social media. 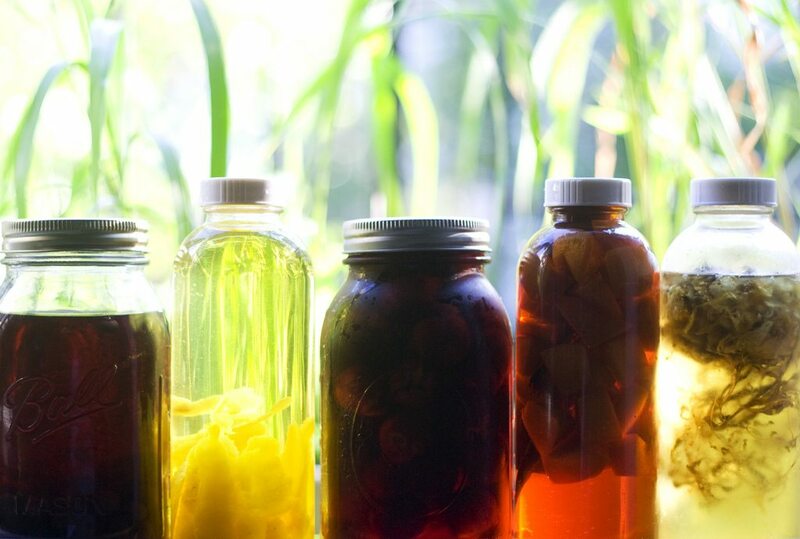 Lastly, you can use this preview to exercise some creativity and devise unique ideas to stand-out from the clutter. If most of the top ranking search listing are using the same page title, then it may be wise to write something a bit more original and standoutish. Now that we’ve pinpointed our keyword phrase and got a lay of the search landscape, we can start crafting our article. Let me first make it clear that for SEO to be effective, it’s not about mentioning our keyword phrase several times over and over in the copy (rather just 2-3 times where it makes sense.) Instead, it’s about using the keyword phrase in the right places. To begin, we’re going to use the keyword phrase in the primary title of the page (which will be the header 1 [H1] in the article.) Using the keyword phrase in the first H1 of the content is a common SEO practice, in addition to using variations of phrase in H2’s and H3’s. Additionally, we also want to make sure that our keywords are used in the URL. In some cases, you may want to trim-down the URL and eliminate words like and, the, or in. Shorter URLs are better then having very long URLs. In this case, we ditched the number “5” and the word “for” to tighten it up. Keep your page titles keyword relevant and under 63 characters. This will ensure that the all of the title appears in the SERPs and doesn’t get cut-off. Lastly, (and assuming your copy is of exceptional quality and mentions the keyword phrase a couple times,) include relevant tags that reflect the subject matter of the article. Each blog is different and everyone has their own philosphy behind using tags for SEO. Just be mindful of the website your writing and use tags in a logical manner. That’s pretty much the basics for on-page SEO. By implementing your keyword phrase in these vital areas, you’re content will have greater potential to rank in Google and attract more visitors. The ongoing next step is being proactive in sharing your content on social media and bringing awareness to it. This will not only help increase the visibility of your content, but can also help your content earn links from other websites and blogs who find it valuable.